That is the number of cupcake muffins that I ate last night. Three is also the number of cupcake muffins that I ate this morning for breakfast. Twelve. Twelve is the number that I will eat if I make another batch. I am really fighting the urge to make another batch but I am not sure if I will win that battle. 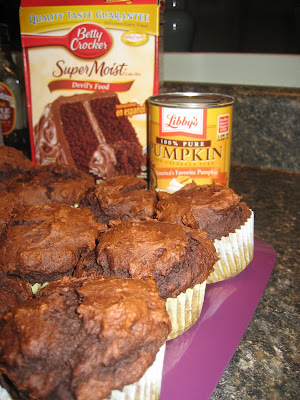 :) All you need to do is mix 1 box of devils food cake mix + one can of pumpkin puree. Put mixture in 12 muffin cups and bake @ 350 degrees for 20 minutes! Those sound absolutely amazing (and easy)! I will definitely be trying those very soon! I told my doctor the reason why I'd gained weight this year was because I'd broken my foot and gotten lazy. I think the real reason is you, Keri Ronk! All I have to say is that when you're breast-feeding you're hungry! Eat now, our "excuses" will diminish before we know it. I just made these for "work" and I'm not sure that I am going to have any to take in to "work" tomorrow. If you want beautiful ones like Keri made, fill up your cups all the way, not just the 2/3 way you do when you make actual cupcakes. I'm eating the less-pretty ones!